Charlie is showing signs of separation anxiety thru destructive chewing and following us every time we move. Puppy vs border collie issues? At first, it was really cute that Charlie follows Matt around like the Pied Piper. Charlie will lovingly gaze up at Matt, and trot behind his every step. In the morning, Charlie will lay in his dog bed until Matt rises. During the day, Charlie will nap on the floor by Matt’s feet. Then follow Matt out into the yard. In some ways this seems a natural extension of his border collie behavior. Herding daddy. 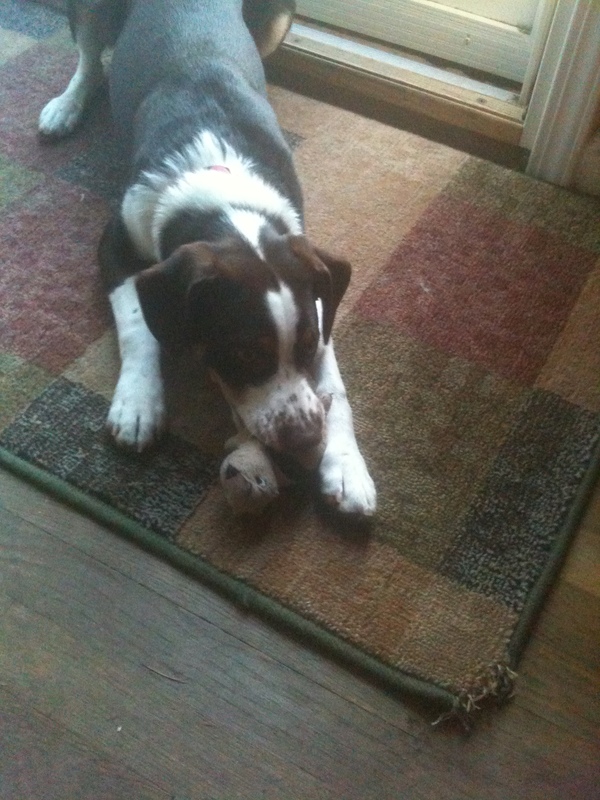 Yes Charlie, it is appropriate to chew on the squeaky squirrel. It is NOT appropriate to chew on the rug (see lower right corner). This lovefest started taking a neurotic turn a few weeks ago. Matt and I walked out front to retrieve something from the truck, leaving the front door open. Charlie immediately jumped up on the couch to look out the front window at us, then started barking. As we walked back up to the house, he jumped on the screen door, howling like mad. It was hard to open the door because he was pushing against it so hard and I didn’t want him to shoot into the front yard. Once I got inside, it took minutes to calm him. Then there’s the matter of the front window. While Matt was away on business, and I had to leave Charlie home alone for the first time, I came back to find he had chewed the window sill. He did some more damage a few days ago, so we bought bitter cherry to spray on the sill. Last night while we were at dinner, he moved up to a munton/window pane divider that we did not spray and did some serious damage. Also this week, he chewed off the corner of a rug by our front door. Matt caught him in the act, and delivered a stern “NO!” but that didn’t prevent last night’s window feast. Matt feels Charlie has deep issues that need to be addressed; I think he needs obedience class. The discussions have been tense. It’s funny how puppy love can lead to relationship stress. I think we are both right. Charlie is stressed out. Possible separation anxiety. I think behavior modification will work. And yes, Charlie needs more structure in his life. In some ways this has not seemed like a big deal to me because the behavior felt familiar. I have had many puppies, and they all go through that terrible chewing phase. I’ve lost countless shoes, books, couches and cellphones to that cause. My laid back approach to this destruction is driving Matt mad. But I do see the troubling signs that Matt has identified. It’s not that he’s chewing, it’s that he’s chewing in response to our absence. It’s not healthy that Charlie can’t let Matt leave the room without freaking out. What began as a charming routine of Charlie following his daddy, has become an unhealthy fixation. And his destruction when we leave him alone is not acceptable. Unfortunately, crating is not an option. We’ve decided to seek help from a behaviorist. Despite our good intentions, our bright ideas have not gotten us too far. We’re hoping an outside voice will guide us in the right direction. If you would like to receive email notifications when Finding Furever publishes a new blog entry, please go to the home page and click on “Email subscriptions” in the right nav. Thanks for joining our journey! This entry was posted in Woof! and tagged adopt, anxiety, border collie, chew, dog, obedience, pets, puppy, rescue, twitter by ourfureverfamily. Bookmark the permalink. I know what you are your going through, as I experienced it with Doggy. Doggy is the first puppy I have on my own, I did a lot of reading before and still do, I know all dogs are different and what’s good for my dog it doesn’t mean it’s good for yours. When Doggy got home I instantly took over, I would feed him, walk him, train him and play with him, my partner would only play with him. Soon Doggy would do all I asked, however, he wouldn’t pay attention to my partner and whenever he would walk him or take him out to do his business, Doggy would pull to come back home cuz he knew I was there, or if were to walk him together and Doggy would pull to come next to me and cry if I went to store and he was left with my partner, was embarrassing. To make this short, I never paid attention to Doggy when I got home from work, I would ignore him until after 5-10 minutes, he could jump, roll and bring all his toys I would just ignore him, my partner did more playing with him and more walks, but what definitely helped was leaving him with the family for a week, that was 3 weeks ago, I swear to go got a different dog now, he lost good part of his shyness and yes, still is crazy for me but not that clingy, he doesn’t sleep in my room anymore, he sleeps next to the fridge lol. I hope you solve your problem the easy way, Charlie is still a puppy and easy to fix. Wow, thanks for sharing. It offers great insight. We definitely need to make changes so I am glad to hear your story. Charlie’s dependence upon Matt is troublesome. Hearing how you handled your situation with Doggy is so helpful! Jillian, I’ve heard that Border Collies will fixate on one person and become super duper attached and neurotic. I really like the last comment, great insight.